Parallel 44 Presents World’s Finest w/ Far Out West at Volcanic Theatre Pub Friday April 5th. Come get jammed out, boogied down, and funked up with these Portland crews. They both bring their own instinctive sounds to age old classic vibes stemming from funk, dub reggae, classic rock and improv jam. Tickets are $12 adv. / $15 door. Doors open at 8:30 and show kicks off at 9pm for this ALL AGES throwdown! Thanks to our loyal sponsors at The Source Weekly & Cascade Alchemy. It’s been a wild and crazy ride for the fellas in World’s Finest since their modest beginning as an acoustic duo in Portland, OR, living rooms in 2011. With a songwriting style rooted in Americana, the band banks on their ability to transcend genres of all kinds. String-centric and bluegrass-inspired compositions seamlessly transition into 3-Dimensional Psytrance, Funk, and Dub soundscapes, leaving their audience with a full circle experience of emotion and dance. Their appreciation for punk and ska can be found peppered throughout their shows and albums, made evident by up-tempo, high-energy offerings. Never happy to settle, Chris, Dan, Sean, Evan, Alex, and Kirk continue to push through boundaries and challenge themselves, while hoping to inspire their listeners to expect the most out of what a band in the modern age can be capable of conjuring up. Six years, countless shows, and five albums later, the band is still firing on all cylinders. The current lineup features six members: Chris Couch (Guitar/Vocals), Dan Hurley (Banjo/Vocals), Sean McLean (Sax/Guitar/Vocals), Evan Malfer (Bass), Alex Weinberg (keys), and Kirk Kalbfleisch (Drums). Their paths have all crossed in Portland, by way of Ohio, Illinois, Eastern Oregon, New York and Las Vegas. As a result of such diverse upbringings, it was inevitable that the band’s sound reflected their coast to coast musical influences. The latest offering from World’s Finest is a 9 song LP entitled “Chromatophores”. A departure from previous work, the album showcases more of the group’s lengthier compositions. Still rooted in a string band style, but with strong emphasis on poignant instrumental explorations, “Chromatophores” is a comprehensive offering of the band’s sound and showcases the members’ songwriting and instrumental capabilities. World’s Finest has hit the West Coast Festival scene hard, making appearances at High Sierra, Northwest String Summit, Summer Meltdown, Oregon Country Fair, 4 Peaks, What the Festival ? !, and Symbiosis. Their unique style has allowed them to connect with fans from all different kinds of musical worlds. 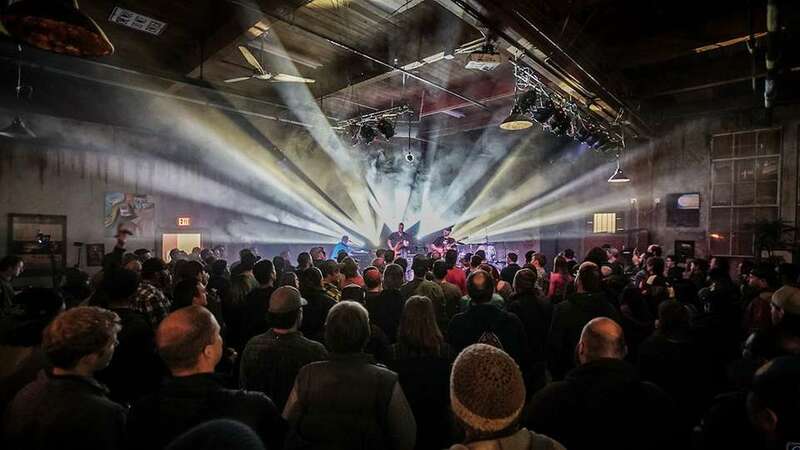 In addition, their chameleon-like approach to their live show has allowed them the honor to share the stage with such acts as Steel Pulse, Leftover Salmon, The Motet, The Expendables, Rusted Root, The Skatalites, Fruition, Ziggy Marley and many more. Far Out West brings a unique and energetic brand of funk that features groovy beats and rootsy vocals. The quartet performs a spectrum of sounds; their original songs fuse together soulful folk-inspired lyrics with crunchy instrumental endeavors guided by the stylings of jazz and rock. Popular cover songs by artists like James Brown, The Grateful Dead, The New Mastersounds, and Sharon Jones are also often sprinkled into the set list. Far Out West has been performing around the Pacific Northwest since 2016 and consists of Liz Chibucos (guitar and vocals), Chad Kimbler (mandolin), Danny Lee (bass), and Forest Carter (drums).